Does the Guggenheim Need YouTube? That’s the turn New York’s Guggenheim Museum is making. Instead of enlisting high-art hot shots, the museum will look to the masses for their fall schedule. Internet nobodys are currently submitting their video art for “YouTube Play,” an exhibit filled exclusively by online entrants. I find the idea very cool. People who are not professional artists have the chance to present work in one of the world’s finest museums. Plus, the pieces will undoubtedly be engaging and weird — after all, it is the Guggenheim. But the self-described “Biennial of Creative Video” begs the question of whether we need a museum, or any physical space, to show this kind of art. YouTube is already something of a gallery, a free one that operates 24/7 right from your computer. Why leave your house to see something you can pull up in any web browser? On the other hand, the point of an art exhibition is to get many people into the same room, thinking and talking about what’s in front of them. “YouTube Play” would be a vast improvement on the way people usually interact with these videos: by leaving anonymous, half-baked comments on a website. And the Guggenheim must have an eye on YouTube’s audience: that coveted demographic of younger users most (if not all) museums long to capture. We live in an age in which some of the most interesting new art is already at our fingertips – it takes years for it to reach gallery walls. So perhaps what the Guggenheim is saying is: if you can’t beat them, join them. Submit your video through July 31 (read the fine print here) — a selection of up to 20 videos will be on view to the public October 22–24, with simultaneous presentations at the Guggenheim museums in Berlin, Bilbao, and Venice. Cairo is dirty, loud, and almost unbearably noisy. When I was there over the winter holidays, I had to work not to become overwhelmed by it all. When I needed a respite from the din, I spent the afternoon at the legendary Egyptian Museum. Still, there was a kind of overwhelm at play inside the museum too. It’s gigantic in terms of size and scope, and easy for a visitor to get distracted by such exotica as perfectly preserved mummies, or the magnificent display of Tutankhamun’s gold chariot. But the piece I loved best was a small statuette of a hippopotamus, standing quietly and nobly in a dark corner of a neglected hallway. Made of Egyptian fiaence (a type of ceramic), it was a gorgeous shade of turquoise blue, with painted-on depictions of plants and birds in black. What struck me first was the color: how had it managed to survive so vibrantly for more than 3,000 years? Then there was the simple, whimsical beauty of the object itself. I read later that the hippopotamus often appeared in hunting scenes on tomb walls to symbolize order over chaos. As the visitors crowded past me, their respective guides chattering in an array of languages, I realized that no one else was looking at the hippo in its case. It was a nice reminder. The biggest, the brashest, and the boldest aren’t always worthiest of our attention. 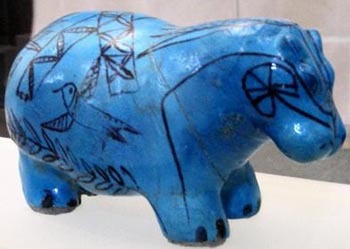 Who knew you could find beauty amid disharmony, and order amid chaos, in the form of a small, blue hippopotamus. New York City’s El Museo del Barrio has reopened after a well-deserved multi-million dollar renovation. I have always loved this little museum, and am very excited to see the permanent collection, particularly the installations, in a space that allows the visitor more room to take in the exuberant work. El Museo del Barrio will celebrate it’s 40th Anniversary throughout the year with special programs and exhibitions. I’ll be spending my Halloween at the (free!) Dia de Los Muertos festival: calavera mask and retablos making workshops, with hot chocolate and Pan de Muerte!